Finding the Best Cordless Blower is pretty much like looking for the Holy Grail when it comes to battery-powered OPE. These tools are some of the least efficient owing to the need to turn their fans tens of thousands of RPMs. But this class of tool is far from being equal with designs all over the map. Even though voltages range from 18V to 120V, inline designs are finally taking over for more models. From there, though, it’s the Wild West for this Best Cordless Blower Shootout. There are a ton of voltage options between 18V and 120V in this shootout, but higher voltage doesn’t always mean greater power. Likewise, having a high number of amp hours doesn’t guarantee you get the best runtime. When it comes down to how much energy each battery has to draw from, it’s the watt hours you want to look at. The easier way to find it is to simply look at the battery. If you do the math, you’ll see that not all batteries calculate out to exactly what’s printed on the pack – but that watt hour designation carries with it a legal responsibility. So for the sake of using whole numbers, most brands rationalize out a little bit on volts and amp hours, but the printed watt hours are what we’re looking at. Note these are the batteries we tested, not necessarily the ones that come with each kit option. Some models have multiple kit options, while others are a la carte with charger and battery purchases separate. When we consider a tool’s ergonomics, it’s a combination of weight, how the weight is distributed, how the tool feels in your hand, and what it feels like under load. A tool can feel great until you turn it on when suddenly there’s vibration and the tool’s weight fights against you. On the other hand, a heavy tool can distribute its weight well and feel lighter than it really is. What throws off classic consideration is that Husqvarna and Stihl get the battery on your back with frames and straps that adjust to fit you. Husqvarna still has some batteries that fit in the blower, but Stihl has taken them out completely. Even if you go for a standard pack instead of the backpack, you wear it on your belt and connect a cord to the blower, making for a surprisingly pleasant experience compared to the rest. A few things came up other than straight up weight and balance in our testing. With most blowers, there is a seam of either overmold or tool plastic on the top and bottom of the handle. Some of these are pronounced enough to feel with your bare hand while you’re using it. Both EGO models, Worx, Greenworks, Husqvarna, and Stihl (slightly) take a deduction here. Other ergonomic deductions include balance offset from Redback, Kobalt, and Snapper. Black & Decker’s thick handle also earns a slight deduction along with noticeably higher vibration with Ryobi. On the positive side of things, both DeWalt models and Makita get a bonus for their more form fitting handles and Kobal’s trigger is the only one that naturally fits a two-finger grip. One of the major benefits of cordless OPE over gas engines is the noise reduction. While each of the blowers we tested come down quite a bit from gas, several are still above the 85 dB(a) mark and get designated for hearing protection from ANSI and OSHA. One thing that’s interesting to note is the difference between the numbers we measured and those listed on the specifications. For one, we tested at wide open throttle (but not turbo). The other variable is that we tested outside according to ANSI standards, but it’s hot and humid here in Central Florida – like 97 degrees with 80% humidity and a Feels Like Temperature in the mid-110’s. That affects sound, especially compared to an air conditioned sound room. The quietest of the bunch goes to Stihl at just 81 dB(a) measured from the ear. 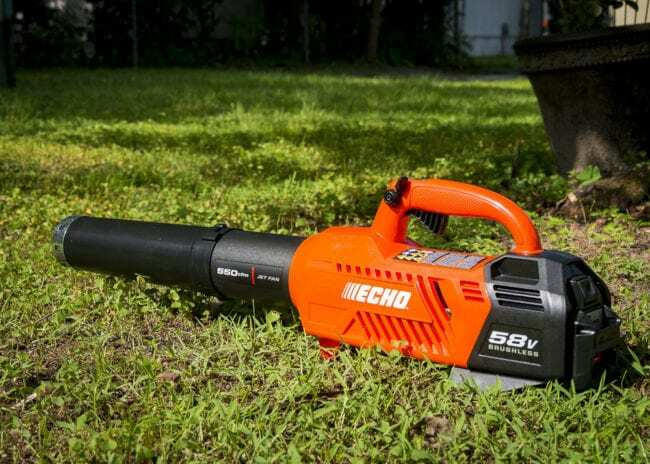 The EGO 530 CFM is just one decibel behind at 82 dB(a) and Black & Decker hits 84 dB(a). On the other end of the spectrum is Redback with 95 dB(a), at Worx at 92 dB(a) along with DeWalt’s 40V Max and Ryobi at 90 dB(a). There are separate features Pros look for on blower than what DIYers get. For once, this swings in favor of the homeowner with a few conveniences that make your life a little easier since you’re likely trading off some performance. Blowers are inefficient, but brushless motors help tremendously. They extend runtime and the life of the motor along with running cooler and eliminating the need to change carbon brushles. A Turbo button gives you a short burst of high power to loosen debris that WOT (wide open throttle) won’t budge. This is like putting the pedal to the metal, though – you’re efficiency will tank here. Whether wrapping completely around the handle or just on the sides, rubber overmold helps you keep a solid grip and dampens any vibration the blower has. It’s unlikely a blower will start up on its own during transport, but a lockout switch of some kind is nice. Many are mechanical, but a few on the higher end are electronic. Even if your blower doesn’t have one, you can simply keep the battery out until you’re ready to use it. By pulling air directly through the blower, you reduce air friction and increase efficiency compared to side intake designs. This hasn’t caught on so much with gas blowers, but they’re not chasing down power, either. Taking the inline design a step further is a full rear intake. This keeps the airflow completely inline. While it’s not terribly inefficient to have intake vents around the side for an inline blower, loose clothing can be drawn in and restrict airflow to the blower. Most batteries have a gauge on them to check the level with the push of a button. Some have a gauge on the tool. Either way, it’s critical to estimating how much working time you have remaining before you’ll need to stop and swap out batteries. *Stihl’s battery gauge is not accessible to the user on the backpack, but the other batteries go on a belt clip and can be seen. If you’re going to be working all day, shoulder straps can really save you some strain. A few of models allow for this convenience. Cruise control of some form is found on nearly all of our models, but it’s curiously missing on a couple of big Pro names – Stihl and Husqvarna. On the homeowner side, Black & Decker is missing it. It’s certainly convenient if you’ve got a blower with an uncomfortable trigger or you’re trying to maintain efficiency by keeping the power level lower. The models that have one all have a slider mechanism except Makita. They use a push in trigger lock along with their speed dial. A scraper in the form of a metal ring or plastic protrusion is helpful for blowers that don’t have as much power. They’ll help loosen wet material that’s been sitting for a while. Most everyone has at least some question regarding if air speed is more important than air volume and how they relate to each other. Popular opinion is swinging the way of CFM (cubic feet per minute) with good reason, but that doesn’t leave air speed completely impotent. You need both to move debris around. When it comes to air speed, Stihl takes the top spot at 168 MPH followed by Echo (145 MPH) and the EGO 575 (142 MPH). On the other end, Black & Decker and Milwaukee tie for the lowest at 100 MPH and Husqvarna is at 105 MPH. *Note: Manufacturer’s listed specs at the highest available power level, including turbo. As the number everyone seems to be shooting for, EGO’s 575 tops the bunch at 575 CFM with Echo and Snapper not far behind at 550 CFM. Black & Decker takes the lowest along with DeWalt’s 40V Max model at 400 CFM and the FlexVolt model coming in at 423. One way to measure force is in Newtons, a number you can also easily convert to in-lbs of torque for impact tools. Using ANSI standards for testing, we measured the Newton force each blower can muster in wide open throttle and turbo if it’s available. The reason this number is so valuable to know is that it takes both the air speed and air volume and translates it into the amount of force the blower is actually producing. In other words, it levels the playing field between MPH and CFM to one number we compare. At WOT, the EGO 575 is the most powerful of the bunch 17.3 N with Kobalt in second at 14.4 N and Stihl tied for third with Makita at 14.0. On the weaker side is Black & Decker at 5.3 N, Ryobi at 6.6 N, and Milwaukee at 8.6 N.
But when you flip it over to turbo for those quick bursts of power, the rankings change a bit. EGO’s 575 still tops the list at 17.3 (no change), Stihl moves up to second with 17.0 N, and EGO’s 530 model jumps up to third with 16.5 N.
Even though there are some impressive numbers here in our Best Cordless Blower Shootout, they’re still trying to reach for Pro level. For the most part, the mark we’re looking to hit is 600 CFM, which EGO gets with their backpack blower, and 200 MPH – two numbers that we’re still quite a distance from hitting together. For Newton force, high-end commercial backpack blower can reach up to 70 Newtons! Value is more than just how much a tool costs, though that’s part of it. It’s also what you get for the price you pay. In many shootouts we’ve done, some of the most expensive tools are the highest value simply because the performance is so much higher than the rest that it justifies the additional cost. Coming in at the best value is EGO’s 530 CFM model with a balance of performance and price that no one else can reach. Echo finishes second with Worx in a very close third. Greenworks, Ryobi, and Black & Decker also score very high in this category. On the lower end are Husqvarna, Stihl, and DeWalt’s 40V Max. In the end, performance is the highest category we weight with Newton force and work efficiency being the major components. From there we also consider ergonomics, noise level, feature set, and value into the overall score. When we put the final numbers together, there were some genuine surprises. Models we expected to rank high fell below some of the homeowner models. That’s a compliment to how far cordless OPE has come, but also a reminder of how competitive the sector is. The bottom line though is that we’re looking at a balance of what Pro and property owners need. Your specific needs may be different, which is why we lay out our findings so you can make a more informed decision if you have different priorities. DeWalt designed the 40V line as their effort to get the attention of Lawn Care Pros, so we can expect more coming from them. This blower is good on hard surfaces but needs an update to compete with the rest of the group. First, it needs to get an inline design and ditch the side intake that introduces additional air friction and rotation. Rotation is why it gets the slight S-curve on the tube. It can also use a turbo button. With runtime being as good as it is, there’s battery capacity to give us a boost. For now, this is a supplementary tool for Pros, but the line has potential as it matures. In what’s clearly a case of the highest voltage doesn’t always win, Redback does have some positives to work with. It has the most complete feature set in design and convenience in the group and is one of only a handful to break 500 CFM. It’s also decent in the ergonomics category and comes with a 5-year warranty. Unfortunately, it’s plagued by high noise levels, low Newton force, and rates the lowest in efficiency. With a pseudo turbo pushing it to its highest output of 10.6 Newtons, it automatically backs down after 45 seconds to just 5.5 Newtons, leaving the user to keep pushing the button to keep the higher force. With better than 17 minutes of runtime on high, there’s really no need to limit the time for most homeowners. Ryobi starts with a low price point and combines it with consistent mid-level performance in most categories to be an excellent value for the homeowner. The only real complaints I have are that it has noticeable vibration compared to the other models and it’s in the top three for decibel level. Aside from that, what you get for the price is a solid bang for your buck. DeWalt’s FlexVolt OPE tools target property owners and Pros that are already using FlexVolt and 20V Max tools from DeWalt, so the battery platform is a major plus. With a nearly identical design to the 40V Max model, it shares the same cons and has plenty of room to improve. One nice bonus DeWalt tosses in is two nozzle options: a standard wide plus a flat for when you need additional air speed. For now, this blower is exactly what it’s intended to be – a good option for home and property owners who mainly need to keep hard surfaces clear. For a brand billing itself as purely for the homeowner, 12th place is a good finish for Black & Decker. Even though their performance stats on paper are the lowest in the group, it uses what it has efficiently to get a lot of work done with a small number of watt hours available. You can certainly list a bunch of ways to make this more of a property owner/Pro style of blower, but that’s who Black & Decker targets. For their user base, the only real improvement I’d like to see is to reduce the thickness of the handle. The low Newton force is good enough for post mowing cleanup and keeping the hard surfaces clear of dry material. Wet grass or leaves will need an extra boost to get moving, but the scraper will help there. Milwaukee has said from the start that their OPE line is only a supplement to commercial Pros’ OPE in areas where there are noise or emissions restrictions, so there’s not a ton that stands out compared to the brands looking to be a primary tool. Even though the performance is on the lower end, it’s not inadequate as a hard surface cleanup tool. You may run into some issues blowing fall leaves and wet debris, though. The major positive for Milwaukee is that they’re using an M18 battery, so you unlock an extensive grouping of cordless power tools that run on the same battery. With Husqvarna being one of the two well-known Pro brands in the group, 10th place is a disappointing finish. Husqvarna never really climbs out of the middle of the pack, though it does take a top 4 finish in ergonomics. The strength of this blower actually lies in the other tools in the system. With a high-capacity backpack battery available along with solid performers in their other tools, Pros will go after this line as the sum of its parts adds up nicely. At the moment, this blower is handicapped by the fact that’s it’s a couple of years old now and more recent blowers have higher performance. And it’s not that it’s a bad blower, it’s just due for a performance boost to justify its high price tag. Husqvarna has a good foundation to build with the overall design, though. Worx comes in with one of the stranger looks in the group that leaves “Baby Got Back” and “All About That Bass” running through our heads thanks to the rear intake. You have a window to the air flow deflector that looks like it should move like an impeller, but it doesn’t. So your kids might not be quite as excited to use once they discover that. But with intake jokes aside, it does pretty well as a value brand that moves up into a solid middle finishing spot. You won’t find a trigger on this model as all the control is set on a dial. It takes a little getting used to, but it’s a functional design. It’s another model that does well with the amount of work it does on the watt hours available, but it’s still limited as a homeowner level blower. The only real negative is that this blower is loud with 92 decibels reaching the user’s ear in our tests. Makita has a legitimate gas OPE line, so there’s plenty of experience to draw from when creating a cordless line. They balance mid-level air speed and air volume to crack the 14 Newton mark, which offers a better power level than most of the competition. Among the major power tool manufacturers, this model ranks the highest, though Kobalt does push a little higher. You just won’t be able to use Kobalt’s 80V battery in any of their cordless tools. Rather than use a variable speed trigger and cruise control slide, you select your speed with a dial and use the push-in trigger lock to keep the blower going. And just because everyone needs more tools, you’ll get a free grinder with the kit for a limited time. Greenworks is back! After a bit of a hiccup with their 60V chainsaw (and a lot of that falls on the chain), their mower, string trimmer, and blower are causing as much excitement as their original 40V line. With the blower, they compete very well in all the performance tests while staying in the top half of battery efficiency. What’s more is they keep the kit price under $200 with a 2.5 amp hour battery. The Greenworks 60V line is shaping up to be the best they’ve built so far. Snapper sports their 82V blower with a Briggs & Stratton battery, but this is a system by the same company that makes Greenworks and Kobalt as well. Regardless of branding, it moves into the 6th place position with excellent ratings in ergonomics, air volume, and efficiency. It falls to 7th in available Newton force, though. Aside from lacking a turbo, the trigger spring doesn’t fully hold the trigger out when your finger is off of it, allowing it to wiggle a bit. Otherwise, there’s not too much to complain about with this unit, but it doesn’t offer much to stand out above the rest, either. Echo’s first 58V blower wasn’t pretty nor all that appealing in performance. With the battery shifting around to the back for better balance, the update is a welcome one with some performance gains to go along with the new design. Echo comes in second in five different areas we looked at, including their CFM and MPH ratings. However, those high ratings only deliver the 8th best Newton force available in a result that raises some eyebrows. Regardless, its power output certainly makes it a capable model in this group and its value at $199 makes it an appealing option. The only complaint we have is the lack of an overmold on the handle. EGO’s 575 CFM blower kicks everyone else out of the way when it comes to performance. The tradeoff comes in the form lower battery efficiency, but that’s to be expected. What may be surprising is that it’s not at the bottom of that category, though. All that power comes at a cost – one of the highest in the group. Like the 530 CFM model, though, you unlock EGO’s excellent line of cordless OPE. That’s all they make, their products consistently rank high, and they’re backed by a 5-year warranty. Not if, but when we break the 600 CFM/200 MPH barrier, this is one of the companies in the best position to see it through. 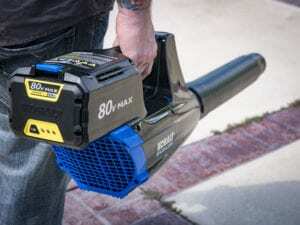 Kobalt makes a strong showing with their 80V blower that hits a high mark in Newton force and ranks highest in battery efficiency. They keep the weight down with a 2.0 amp hour battery, but that limits the runtime to just under 13 minutes at WOT. There’s not a lot of downside to this blower with the price coming in at a pretty reasonable $249. The only issue is that the entire 80V line isn’t as well rounded in performance as the blower, though each tool is capable in its own way. That will relegate it for homeowner and property owner use. Stihl represents one of two brands that’s really ready to tackle the needs of commercial and residential Lawn Care Pros with the runtime they need to get through the day. Obviously, Stihl does extremely well in the performance department, but they’ve got ergonomics nailed as well. By shifting the weight of the battery to either your hip with a pouch or your back with a backpack battery, your arms only need to lift 5.5 pounds. And there’s enough force for the blower to just about hold its own weight when pointed down. The downside is clearly cost, but Pros we talk to that have contracts with Stihl seem to love the brand and the relationship they have with their local dealer. It’s a business model that works well for them and should continue as we shift to more cordless OPE. EGO’s 530 CFM blower takes a backseat to their 575 CFM model in Newton force but is really an excellent blower in its own right. Reasonable Newton force at WOT combines with top 3 power when you hit the turbo button. The result is a solid showing in the runtime department with the power to work around stubborn debris. EGO does nothing but cordless OPE and they have one of the most complete and highest performing lines available. Even though this isn’t the most powerful in our Best Cordless Blower Shootout, its consistently high rankings make it the best overall.